Colorado False Hellebore (gone to seed) and Quaking Aspen. For my most recent outdoor outing (is there really any other kind of outing worth noting?) I was exploring some public roads that were new to me on part of the San Juan National Forest. This summer has been kind to the region, blessed with rain in late summer. Not too much, either. The fire danger went down from Very High in June to Low now. Pretty sweet. Driving north into the forest from Mancos, Colorado soon had me back into Ponderosa pine, aspen, mountain meadows, and–even higher up–spruce and fir. The dirt roads were dry and it wasn’t too crowded with summertime recreationists. Hesperus Peak in the La Plata Mountains, August 2017. I stopped at a nice viewpoint up the West Fork of the Mancos River canyon to the high peaks of the La Plata (“Silver”) Mountains. To Hesperus Peak, one of the four mountains sacred to the Navajo people. Puffball mushroom, big as a greatly over-inflated football. At a nearby junction, I spotted a nearly-white blob in amongst the greenery. Could that be the giant edible mushroom called the Puffball? It was. In perfect condition to come home with me, too. A red mushroom amongst the forest floor greenery, San Juan National Forest. Further along there were more mushrooms, which I could not identify at the moment. The rule about eating wild mushrooms is that you never should–unless you can be positive of the identification. There are many poisonous species. There were some berries, too. Common was Red Elderberry, Sambucus racemosa var. pubens. The seeds of the berries of this species are considered poisonous. Red Elderberry fruit clusters and foliage. As far as the earliest whispers of fall, the False Hellebore “Corn Lily”) were done for the season and were turning from green to gold. Soon the other forbs of the high forest will be turning, too. Then it will be the main event: the aspen colors. We’re still a month away from that, but for now here is my favorite aspen forest photograph from the day. Aspen stand, late August, San Juan National Forest. Photo location: San Juan National Forest, Montezuma and La Plata Counties, southwest Colorado. Mule’s Ears and Silvery Lupine in bloom, Ouray County, Colorado. Late June and I was back in the high country of the San Juan Mountains in southwest Colorado for the first time this summer. After a stellar day at Lizard Head Pass, I was off the next morning to Ridgway, Ouray, and Durango. Maybe I got started too early, after photographing the Milky Way during the middle of the night. Because shortly before dawn I pulled over for a nap. Afterward, the sun was rising and I could see all the early summer wildflowers in bloom in nearby pastures. I had chosen my pre-sunrise nap location well, it seemed. Photo location: Ouray County, south of Ridgway, Colorado. Mountain Mahogany (Cercocarpus montanus) leafing out and flowering, Mesa Verde, April 24. Mesa Verde means “green table” in Spanish. Mesa Verde National Park is a tilted green table, heavily dissected by its canyons that also flow south. Other than its famous prehistoric cliff dwellings and dizzying geology, the Mesa looks rather drab after the snows are gone and the deciduous vegetation has yet to leaf out. Thus it has been interesting watching the progression of springtime through the various shrubs, forbs and grasses as they turn the brown and gray back to green. Bitterbrush (Purshia tridentata) leafing and blooming, Mesa Verde National Park, May 4. The earlier leafing species such as Mountain Mahogany (Cercocarpus montanus) and Utah Serviceberry (Amelanchier utahensis) seem to be well adapted to the weather swings of early spring. They don’t sweat cold snaps, even the occasional late snow storm. Utah Serviceberry (Amelanchier utahensis) blooming at Mesa Verde, May 7. On the other hand the “Oakbrush”, the Gambel Oak (Quercus gambellii) that tough small tree that resprouts vigorously even after the major fires that occurred in the park about 15-20 years ago, is cold sensitive. It leafs out later, and cautiously. I was to find out why during this particular spring. Gambel Oak leafing and about to flower, Mesa Verde, April 24. Things had been greening up nicely in the park. In fact, it was a very early spring, especially judging by how early the yucca plants were beginning to send up their flower stalks, at 7,000 feet in elevation. North Rim of Mesa Verde, Gambel Oak barely leafing out, May 4. However, things changed on May 18 when a late snow storm hit the area. Late snow, May 18, Montezuma Valley Overlook, Mesa Verde. The early leafing shrubs showed why they have the confidence to take late cold snaps in stride. A little bit of cold damage to their newest shoots, but otherwise no sweat. 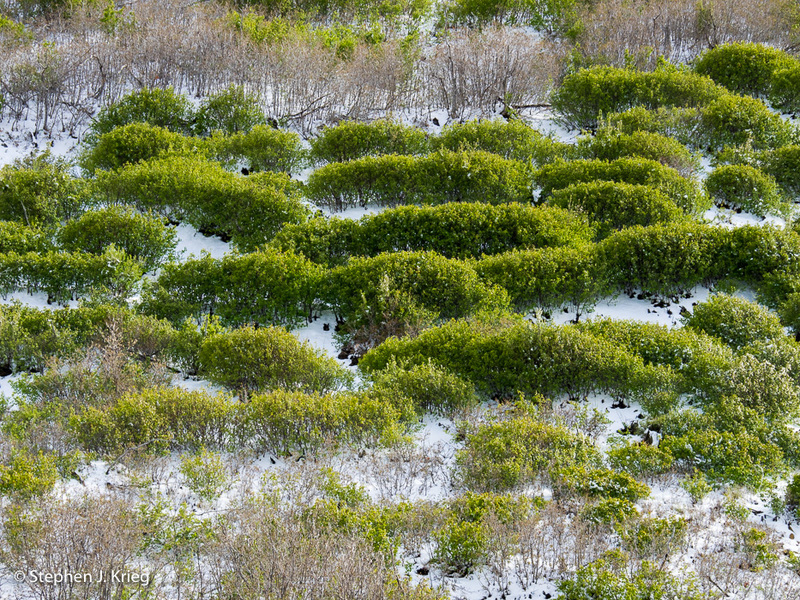 Early leafing shrubs in late snow, May 18. The Oaks are still brown. The Oaks, though, were stunned. Tender baby leaves, and flowering catkins, were zapped. The storm passed quickly, providing some gorgeous parting shots. But as far as the Oaks, you could almost hear them arguing (“I told you it was too early!”). Wilted Gamel Oak leaves after the May 18 cold snap storm. So the Oaks had to regroup, not that they are not splendidly built for that, too. (I told you they are tough). Their Plan B was to shift their energy to leafing out yet again, and the heck with the flowering this year. There’s always next year, you know. May 18 ice on Mountain Mahogany, Mesa Verde. Which means few acorns, that round fat nut that wildlife like deer, turkeys, and rodents feast on in the fall. But even more so the black bears, which chow down on the acorns for their high starch content, building up the layer of fat that their bodies will depend on during their winter hibernation. So we could see more bear incidents this fall, as they try to supplement their diet with human garbage and such. Above Montezuma Valley Overlook, Mesa Verde, June 11. But finally, the Oak shrubs/trees are almost fully leafed out. The Green Table is back to being almost at its height of green for the summer. At Montezuma Valley Overlook, Mesa Verde, June 12. Southwest Colorado, the first day of June. I chose to spend my early evening walking at the Far View pueblo sites at Mesa Verde. Along the trail I am taken by yet more pure white blossoms of Fendlerbush (Fendlera falcata (F. rupicola), a tough and beautiful shrub that thrives here. Fendlerbush blossoms set against their green foliage. Photo location: Mesa Verde National Park, Colorado. See more of my photography at NaturalMoment.com. Point Lookout, from just inside the entrance to Mesa Verde National Park. It will be even greener soon, when the Gambel Oak have fully leafed out. When visitors drive into Mesa Verde National Park in southwest Colorado, the first thing that grabs their attention is a promontory called Point Lookout. As they will soon find out, they will be driving up a series of switchbacks taking them around its eastern flanks to a notch in the topography that has them up onto the northern end of the mesa. From there the road winds back and forth as it negotiates the North Rim, heading toward the Far View Lodge, and on to the Museum and the Cliff Dwellings. Utah Serviceberry in bloom, Point Lookout Trail. But what of that vertical chunk of bright sandstone towering far above the greening slopes? Wouldn’t it be awesome to be on top of that, looking over the edge? Utah Serviceberry in bloom along the Point Lookout Trail, overlooking Morefield Campground. The gray patches are Gambel Oak, which are just starting to leaf out. It is, and you can go there, too. It’s the Lookout Point Trail, and it begins at the end of the campground road, near the Amphitheater. Looking southwest along the North Rim of Mesa Verde, from the Point Lookout Trail. The trail is only 2.2 miles round trip, but it does climb 400 feet in the first mile. So it’s strenuous, but well built, with plenty of switchbacks to keep the grade reasonable. And there are spectacular views along that part of it, as well. Paintbrush blooming atop Point Lookout, May 4, 2017. Before too long I had crested the southern rim of Point Lookout. Easy walking on top from there. The northern rim of the Point is spectacular, of course. Rather dizzying from too near the edge, looking down on the park road, the Visitor and Research Center and the Mancos Valley, with the still-snowy La Plata Mountains in the distance. View north from Point Lookout, with the Mesa Verde park entrance road far below. Another view to the southwest peers out over the Montezuma Valley and the town of Cortez, with Sleeping Ute Mountain in the distance. View southwest along the North Rim of Mesa Verde, toward Sleeping Ute Mountain. Then it was back down the switchbacks to the trailhead. Going downhill, working the quad muscles this time. A good walk on a stellar early May day, and I didn’t meet another person in the 1.5 hours it took. Sweet. Tent caterpillar nest in Utah Serviceberry, Point Lookout Trail. Utah Serviceberry in bloom at Mesa Verde. Springtime on Mesa Verde, the “green table” in Spanish. A titled table, and highly dissected by canyons draining to the south. Which is getting greener by the day, now that it’s springtime. But this is about some of the vegetation growing on the upper reaches. The most noticeable shrub in early spring is Utah Serviceberry, Amelanchier utahensis, both because of its many white blossoms and because it adds a lot of greenery to an otherwise drab landscape this early in the season. Double Bladderpod, Physaria acutifolia, has a whorl of silvery-green leaves that mostly hug the ground. It raises a lot of small yellow four-petaled flowers. Back to the white blossoms, we have Patterson’s Milkvetch, Astragalus pattersonii, of the pea family. My source says that there are 13 different species of milkvetches at Mesa Verde. So how is one to really know? They grow on shale slopes and soils containing selenium, so you neither want to smell them very long, or eat them. Their feathery blossoms, though, are just fine for looking at. Gambel Oak, Quercus gambellii, is the tough, small tree that keeps resprouting from wildfires, of which Mesa Verde has had some horrendous ones over the past couple of decades. And it’s good for the soil that they do resprout rather than die, because they hold the soil on on the slopes. The other plant species should thank them. Emerging leaves and flowers of Gambel Oak. We bring up the rear, so to speak, with another yellow wildflower that catches the eye on a drive along the park. This one is Arrowleaf Balsamroot, Balsamhoriza sagitatta. In the Sunflower Family, so you know it likes to show off. As it should. Elk, deer, and the feral horses like it, but somehow it tolerates being munched on by them, too. So did the Ute Indians. Stay tuned for more. Spring is just beginning in southwest Colorado. Hood’s Phlox, April 2, 2017, Mesa Verde National Park. I stopped off at the Cedar Tree Tower site on Chapin Mesa in Mesa Verde on a recent April evening. The tower site is a short, paved drive off the main park highway. Just before I got to the parking area I spotted some Phlox wildflowers already in bloom amidst the green blades of new grasses sprouting. Hood’s Phlox on Chapin Mesa in Mesa Verde National Park, April 2, 2017. It was Hood’s Phlox, Phlox hoodii, as I learned from the book Wildflowers of Mesa Verde at the Mesa Verde Museum Association’s bookstore. https://www.mesaverde.org/category/books/plants-wildlife. I continued on to the Ancestral Puebloan tower site. Cedar Tree Tower and kiva site. Archaeologists believe that this particular tower was two stories in height. It is located on a high spot on Chapin Mesa (a part of Mesa Verde), with a view in all directions. They farmed this area in corn, beans, and squash. Nearby is a trail to some of the terraces and check dams they built to collect the fertile soil and capture water from rain and snow melt. Looking south toward one of the many deep canyons that dissect Mesa Verde. Notice all the standing dead trees. This portion of the park was burned by the Long Mesa Fire in 2002. Fire is a natural part of the pinyon pine – juniper high desert forest community, and the Long Mesa Fire was naturally caused, by lightning. However, a century of unnatural fire suppression has caused higher than natural fuel loadings, making such catastrophic fires more likely. The kiva adjacent to Cedar Tree Tower. The roof has not been reconstructed. But it begs the question: Did this area look all that much different when the Puebloans were living here? Their need for wood products was tremendous, both for heating and cooking, as well as roof beams for their pueblos and kivas. There may have not been many trees left nearby. By the way, there are no cedar trees on Mesa Verde. The early pioneers thought the Utah juniper trees were cedar trees, as best they knew. Photo Location: Chapin Mesa, in Mesa Verde National Park, southwest Colorado. For more of my photography, go to www.NaturalMoment.com.